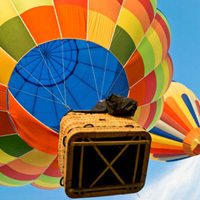 Live the peacefull experience of a Hot air ballon ride. - The traditional landing ceremony with sparkling wine. The price is for one person. Several persons can take place aboard according to the type of Hot air balloon used. This package also include a 10$ credit on you next purchase on the Recreational Flight E-Store. Note: For Quebec city, lodging is available at a good rate in an ancestral house of the old city.